Down & Before is an odd Adventure-platformer made in a week by 5 students. The Jam theme was "Behind you, it's scary". With Jules Ducasse, the other game designer, we followed the path of the metaphore. The player would have to run away from his regrets and repair his mistakes throught a mystical journey. The game controls only with the mouse and the scroling wheel. 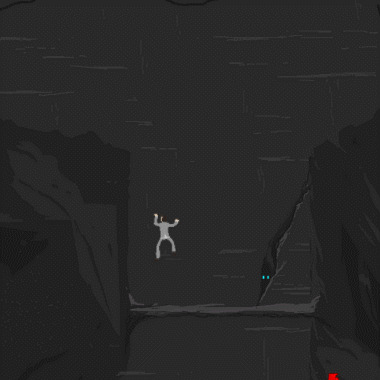 Scrool up to Jump, Scrool down to catch yourself and scroll down some more to keep climbing. This control scheme makes for a repetitive and tiresome comparaison to the pain the character have to put himself through to redeem himself. Unfortunatly, due to technical issues, we cannot export the game. You will climb a huge moutain, a massive tree and floating ruins. This accelerated footage shows off the camera comportement. My job consisted mostly of coding the game in Construct 2. I also brainstormed and pitched the inital concept with Jules. After that, my job as a game designer was mostly advisory since Jules was in charge of Quest design and level design. The background was a single big asset, wich was way too heavy to be exported. At the very end of the jam, I tried to divide it in smaller chunks but it was simply too long to be completed for the deadline. This was my big takeway from this jam !